The Best Instant Pot DUO60 7-in-1 Multi-Functional Pressure Cooker is an electric pressure cooker produced by Instant Pot that works like the best pressure cooker, slow cooker, rice cooker, porridge maker, steamer, sauté/browning, yogurt maker and warmer. It is the premium product of Instant Pot’s line of electric pressure cookers. The Instant Pot is the successor of other obsolete electric cookers which have historically struggled to compete with traditional pressure cookers due to their inability to sauté and brown food before pressure cooking. The Instant Pot IP-DUO60 boasts the ability not only to get hot enough to brown meats and aromatics but also the ability to keep food at constant temperatures for other purposes like fermentation. Due to its high cost, people are generally hesitant to give Instant Pot a try, but over the course of a year, savings from time saved might be worth it overall. 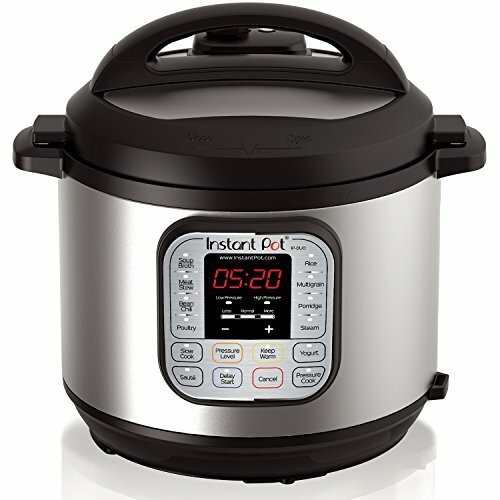 Below are some features unique to the Instant Pot that give it an edge over competing for electric pressure cookers. The Instant Pot offers seven functions in one. It is a jack-of-all-trades in the kitchen that can make your stew and your yogurt, your soup and your rice, your porridge, and your oatmeal. If you currently have a rice cooker, a slow cooker, and a pressure cooker in your kitchen, you can effectively replace all three with a Best Instant Pot. This is a great product for people with smaller kitchens for which space is a premium. The Instant Pot comes infinitely programmable at the touch of a button. Its intuitive interface offers options of slow cooking, stewing, porridge, steaming, and many more. Novice chefs can take the default route and cook with preset times and temperatures, but experts can adjust pressure and temperature, along with the duration of cooking. This allows for a range of expertise from college students to grandma. Cheaply made pressure cookers can often be a hazard as pressure built up on the inside can have explosive power without the proper safety mechanisms. Safety with a pressure cooker should be priority number one, especially for new cooks, and Instant Pot has not skimped on these features. It is one of the safest pressure cooker on the market, electric or not. The Instant Pot is simply designed with a single chamber for cooking. The stainless steel inner pot is removable and dishwasher-safe. The base can be wiped off with a damp cloth. The lid can also be washed in a dishwasher. With few detachable components and ergonomic design, the Instant Pot is as easy to clean as it is to use. The Instant Pot comes in stainless steel and black, which classically pair with just about any decor. Unfortunately, this is the only colorway available for this product. While the Instant Pot is very useful in a variety of ways, it IS just one pot. So while it can make rice and stew separately, it will not actually replace a rice cooker and a slow cooker in the sense that you can not make them simultaneously. If you have a large kitchen and have plenty of counter space, an Instant Pot might not be absolutely necessary. The Instant Pot DUO60 7-in-1 Multi-Functional Pressure Cooker is a premium product for people who are serious about cooking. Unless you will make the most of its slow cooking or rice cooking features, a stovetop or regular electric pressure cooker will most likely suffice. However, in terms of utility and ease-of-use, few competing products approach the Instant Pot. The space-saving power of a 7-in-1 product, as well as the fact that it does not require a burner on your stove, is perfect for economical chefs or urban apartment dwellers. Even taking advantage of three or four of its functions (which might be an everyday thing–morning oatmeal?) might make the Instant Pot a worthwhile product. This is not to mention its ability to make yogurt, a product that can cost many times its cost of production. Overall, this product fits extremely well for a certain demographic but is not necessarily appropriate for those who only want a pressure cooker.